I turned 40 last weekend. As much as I tell myself that one shouldn't obsess about birthdays at the decades' fringes, I found myself having those feelings of angst and loss that I have struggled to transcend over the past two and a half years. The birthday proved to be a low key occasion, visiting with family and delivering their Girl Scout Cookie orders. I picked up my daughters from STBX late morning on Saturday the 14th and headed up to the northeast side to eat lunch with my mom at this neighborhood pub that she and her friends like to frequent on Saturday evenings. After that, the girls and I headed back south, going to The Small Town to visit with my dad and stepmom. En route, I stopped by STBX's to pick up a peanut butter bundt cake with chocolate icing for me to take with me. My dad set up an awkward situation by inviting his sister (my aunt) over without giving me a head's up. From what I gather, he has been making overtures to her about resolving some of their past disagreements. The kids had fun seeing their grandparents and eating cake. 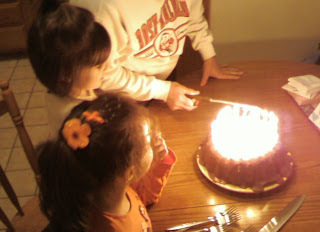 STBX had asked my stepmom to make sure that the cake have 40 candles on it. 11:48:20 AM STBX: fyi my crying last night was not over you. i was just being emotional. i hope you had a good 40th birthday. 7:14:34 PM Me: I feel like I should have gotten drunk this weekend, but lacked the ambition. There is a certain darkness in my prevailing moods that has me worried. Aside from the time I spend with my daughters, I don't seem to have motivation for much anything else than work, and I've put a lot of hours into that. On a couple weekends, I've gone so far as to pull old to-do items off the shelf and implement them on development branches so that they can be incorporated into releases when they are ready for them. I've also managed to investigate and resolve some bugs that have perplexed others in the development group and have vexed our product support team. The efforts have paid off in terms of improvement to the software and the compensation. In late January, my boss recommended and got a 6 % pay raise for my efforts the past year. With the company routinely busting sales goals, they can afford to do it, which is a stark contrast to my former employer, who gave me zero raises over the two years I worked for them. 8:52:50 PM STBX: well i got invited to a employment open house with (Big Postage Meter Company). 8:53:05 PM Me: That's a Good Thing, no? 8:53:53 PM STBX: i guess. it is part time and in (a town west of the Circle City) and part of me doesn't want a job yet just want to have it waiting when i get done with unemployemnt. 8:54:37 PM Me: It comes down to whether you think the job market will have something you want when the benefits expire. There's a part of me that feels weird about filing for divorce while she is unemployed. When I worked out the child support to put into her account by direct deposit in August, it was based on her wages at her old job. I wonder whether the court would accept that figure with her current situation. As a result, I have been procrastinating finishing off the paperwork. She reminded me tonight, as I dropped off the kids, that we needed to get that process started, so maybe she's ready to move on and I shouldn't worry. I also haven't been that motivated to work on my taxes. There are a couple of items on income that have me worried that we might wind up owing money, and that's not a place I want to be as I get ready to file a legal proceeding. We had some heavy snowfall not quite a month ago, which made boarding my bus at my normal location an unsafe proposition at best, which threw my routine off. 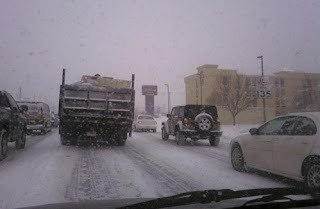 I wound up staying home on Jan. 28th. 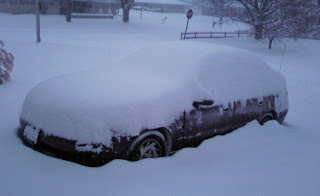 Here was the view from my front door that morning. The person whom I said a couple months ago might be a potential recurring FWB situation has faded into the background. She's had some recurring drama with her own marital dissolution, and she's decided that she is looking for something more emotionally involved. We still exchange e-mails and texts, but that's about it. Combine all of this, and there is this general feeling of a lack of control over my destiny. I've noticed that it's hard for me to find pleasure in much of anything. At some moments, I wonder if I suffer from Even going out to lunch at work seems to be excessive. Work is the one place that I still feel like I have a say in my destiny. The state of disorder in my house reflects the lack of motivation. I skipped doing laundry over the weekend of my birthday and didn't do laundry until later in the week, when I needed clean clothes for work. Today, I am caught up again. I finally forced myself to do dishes today, when I didn't have anything for the kids or me to eat off of. Normally I'm pretty good about doing dishes because I have a dishwasher, but it has been making intermittent funny noises, and it's performance has been spotty the last few times, I so figure that I'm going to have to shell out some money to have that fixed. The house is in its post kids weekend tornadic state. That's nothing new. What is new is that the mess is on top of the mess from when they were here two weeks ago, which I never got around to picking up. OK, that's the bleak stuff. And in all fairness, it hasn't been all doom and gloom. On the 7th, I took my older daughter to her first Girl Scout Father/Daughter dance. They had two dances, broken down according to age groups. The group that included Daisy Girl Scouts ran from 6 - 7:30. We spent about 1/3 of it waiting in line waiting to buy a corsage and get our picture taken, but she had a really good time. 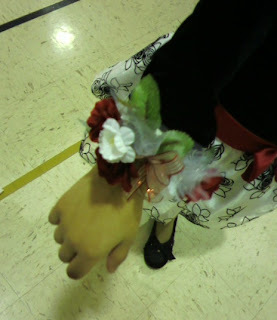 This picture of the corsage should give you an idea of how cute her dress was. The DJ played a mix of 80s and contemporary pop, the stuff that's all the rage on Radio Disney (or as my daughters call it -- "Disney Music"). It was fun afterwards pulling up video clips of songs like "Mickey" and "Girls Just Wanna Have Fun" on YouTube and watching them with Bella. On the 10th, my younger daughter finally followed through on her desire to paint my nails. 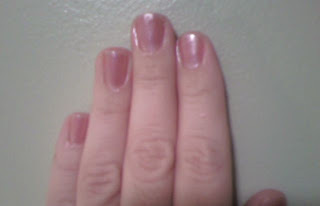 To my cringe, she picked out a pink polish, but I braved my way through it. The photographic evidence is given below. Our department has a couple of quirky customs that result in the accumulation of cash for our department. The first is a cover charge that is assessed for arriving late to a daily status meeting. It costs a buck to get in. The second is a friendly wager system for silly outcomes. Over time, the cash has overflown the cup used originally to house the booty, so I suggested we get a bank with an equally quirky personality. My boss bought into the idea and got it. Here is another person's video of the bank. It has a pretty large repertoire of phrases, and it usually burps after you have fed it money. I stayed late after work on the 13th to celebrate the passage of 1234567890 on the UNIX epoch clock, which transpired at 6:31:30 pm our time. We played cards, drank beer, and cheered the clock on to mark the occasion. Finally, on weekend of the 7th and 8th, got an IM from an old friend who no longer lives here. She was passing through the area and asked if I was interested in meeting up the night before she had to leave. It wound up being a fun time, and we wound up with smiles on our faces. That's about all the stuff I can think of for now. I'll try to do a better job of keeping in touch. A month (plus a few days) is way too long to go with dropping a line.